Recipes using offal (kidneys, liver, tripe, hearts, sweetbread etc) in the ingredients. Very cheap and tasty. 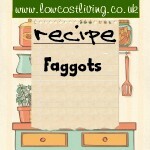 This faggots recipe is simple, delicious, and a great way to get offal into reluctant eaters. Perfect for a cold winter's day. This lamb's liver recipe is tasty, cheap, and warming for a cold Winter's day. Served with buttery mash it is a favourite here. Liver and Tomato Bake goes well with any green vegetable and/or chipped or mashed potatoes. 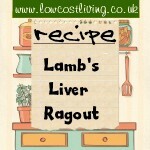 Recipe for Braised Liver & Courgette Casserole – Serves 4 – Cheap and simple. Nice with some mashed potatoes. Recipe for Chicken Liver Risotto – Serves 4. Recipe for Kidney Plan – Serves 4. Best eaten warm. 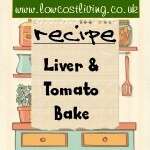 Recipe for Slow Cooker Liver & Bacon. Recipe for Sweet & Sour Pigs’ Kidneys. Recipe for Grilled Calves Liver and Bacon. Recipe for Lambs Kidney with Cucumber.